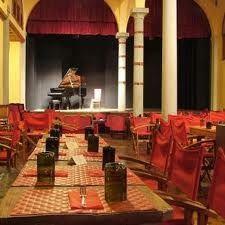 The "Teatro del Sale" is a very charming place with the setting of the theater. Maria Cassi is the local sponsor and his performances fills the interesting programming this room that is also a very popular restaurant with the delicious cuisine of master chef Fabio Picchi. It is located in the area is St. Ambrose, "Il Teatro del Sale", that theater was and still is used in the evening shows of various kinds in combination with buffet dinners with amazing goodies. The environment is beautiful, spacious, well decorated and simple. The food is exquisitely and the kitchen is at vista.Picchi announces loudly the dish that has just prepared and the crowd eats happy. Everything works fine and you can take home even jams and home-grown products.